The use of lentils or the ones broadly referred to as ‘Dals’ in my mother’s kitchen was not limited to sambhar(as is the common misconception). Lentils were cooked in various amounts of moisture, resulting in dishes that would range from very watery to dry. We ate almost equal amounts of all forms of dal, tur or pigeon peas, masoor (Hyderabadis love this) or red lentils, channa, moong and urad to name the obvious ones. One of my favourite ways to eat dal is this dry whole red lentil preparation. Ofcourse I love drenching hot steamed rice in ghee and topping it with this plain boiled tur dal with just a hint of flavour through the tadka. This recipe uses Split Moong dal and pairs it with the mildly sharp green onions to make for a cross between a dry vegetable dish and dal. It pairs best with hot chapattis and is a good option for a packed lunch. The picture in the post is of dabba that became K’s lunch. Do not be fooled by the simplicity of its appearance. This is one of my favourite ways to eat Moong dal. In a pan, heat the oil, splutter the whole cumin seeds and add the asafetida. Add the green chilli, white part of the onions and sauté till wilted. Add the ginger garlic paste, turmeric, red chilli powder and sauté for 1-2 minutes till the raw smell disappears. Add the tomatoes and cook till they turn mushy. Add the washed and drained moong dal, sauté till it begins to change colour and is nicely coated with the masala. Add the salt and ½ cup water and bring to a boil, partially covered. Add another ½ cup water and cook till just done. The dal must be cooked but not mushy. Stir in the green parts of the spring onion and sauté till wilted. Continue to cook for a few more minutes till the green onions are cooked. Do a taste check and adjust salt and spices if needed. Take off the heat and cool a bit before serving. I am sending this off to one of my favourite blogger’s and Master Baker Aparna who writes the wonderful My Diverse Kitchen which is hosting the 61st Edition of a much loved blog event titled My Legume Love Affair. An Event started by Susan of The Well Seasoned Cook and now taken forward by Lisa of Lisa’s Kitchen. After ages, I am making an effort to send some entries into blogging events. What better time than this. Do go back after the 31st of July to see a round up of all the entries. 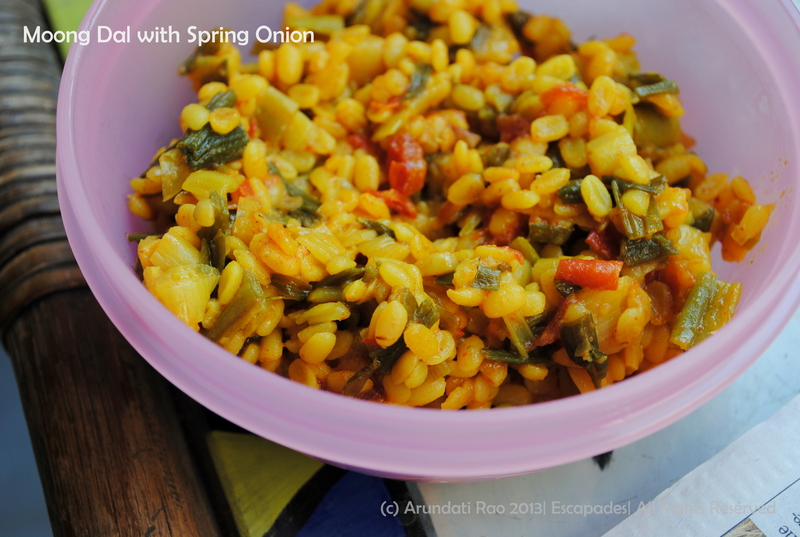 The moong dal with spring onions looks really healthy and delicious! I love spring onions and am always looking for different ways to incorporate it. Must try this soon! I love many varieties of South Indian dals especially the moong salads and sundals. This is quite an unusual combination. very flavourful. Thanks for participating in this month’s MLLA.